A particular form of vitiligo reported as ‘infl ammatory vitiligo with raised borders’ has been rarely described, and this condition is associated with lichenoid infi ltrates in the margins of progressing lesions. Histopathological fi ndings in still-pigmented progressing borders of common NSV and SV may show less-intense, but similar features, suggesting that common vitiligo could be considered as a clinically silent chronic infl amma-tory skin disorder. 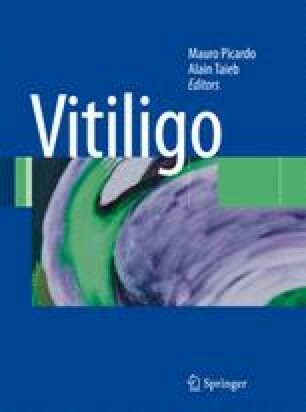 Clinically infl ammatory vitiligo has been sometimes associated with infectious or infl ammatory diseases, and may result in this context from various pathomechanisms.